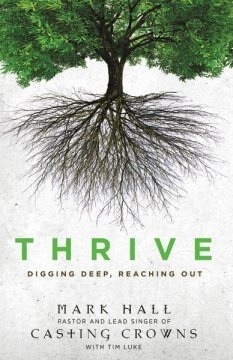 THRIVE: Digging Deep, Reaching Out, written by Mark Hall is a book centered around helping its readers take the next step in their faith, to grow deeper, stronger and more focused on God within their lives. The overall theme of this publication comes from the first two sentences presented in chapter one: “You were meant to do more than just survive. You were meant to thrive.” Mark’s intention, through the pages of this book, is to demonstrate that, as Christians, we were not meant to simply survive our time on this earth, we are meant to thrive, to grow, to reach out and make an impact for the glory of God and the edification of His children. To bring his point into focus, Mark utilizes a blend of his life experiences as a believer, his experiences as a pastor, his musical career, and the truth of the the scriptures. To solidify his point Mark also openly shares his personal experiences with dyslexia and insecurities, thus demonstrating his imperfections and reliance on God to keep him grounded and focused. The publication is easy to understand and powerfully written. It has the potential to unlock the power of faith found within the Christian who wants to present the existence and power of God within this world, thus it is a recommended purchase. How can we call ourselves Christians if we are unwilling to act in a manner that reflects our claims? How can we call ourselves Christians if we are unwilling to treat others in the same manner that God extends to us? To be a Christian in words only is to fail in the eyes of God. To be Christians in words only is to bring a false impression of God into this world. Being a Christian is a lifestyle choice, and extending mercy to others is part of this choice. As we show mercy to others, we are, in essence, bringing them into the presence of God, where they can find everything they need to have a better life and better eternity. Lord, help me act as I claim to be, Your servant. Jesus graciously healed ten lepers. He brought to them a new life, a life that allowed then to converge back with society, a life that allowed them to see their family and friends. To say they were excited had to be an extreme understatement, but only one reacted with great respect towards the opportunity Jesus had present them all. One of those that were healed came back into the presence of Jesus and offered Him honor for the blessings He brought forth into his life. One retuned, and the others went off to enjoy their new lives. One began to walk upon the correct path, and the others chose their own paths. Does this attitude sound familiar when you consider your own life? How often has God blessed but found us walking in the opposite direction? When others look deeply into your life, do they see a person willing to walk toward God and give Him glory or someone who will receive and leave? Lord, I pray You find me seeing all that You have done within my life through the expression of my gratitude. Most people have a tendency to trust in others over time. As they build their relationships, they are more willing to expose themselves and open their lives up to others. Their are some people that we would trust with our lives or the lives of our children, and still their are others that we have known for a long time that we wouldn’t trust to make us a sandwich. Trust is earned, thus trust could be considered a gift. Considering this ideology, God must have complete trust in each of us, for He has placed within our hands the greatest task of all, the spreading of the gospel. Are you living within the purpose that God has entrusted to your life? Lord, You have entrusted me with so much, I pray you find me living daily powerfully within this trust. Luke 24:27 And beginning with Moses and all the Prophets, he explained to them what was said in all the Scriptures concerning himself. What a moment that must have been for those within the presence of Jesus. Here He was, unbeknownst to them, teaching powerfully about Himself as they walked along the road to Emmaus. The events of the previous days had left them hurt and confused, and Jesus wanted to help them embrace the magnitude of the situation while becoming more at ease within their hearts. At first, they were kept from recognizing Him, but as they were eating together Jesus broke bread, and their eyes were opened to His presence. Their lives were blessed by two things: one obviously being the presence of God, and the other the teaching of His Word. While we do not have the physical presence of God with us, we have, to guide us, His Spirit and His Word. These tools, these blessings, were purposefully brought into our lives for our utilization, that we might walk a more focused, more Godly existence upon this earth. Are you utilizing these blessings within your life? Lord, fill me with Your Spirit and speak to me through Your Word. Luke 18:11 The Pharisee stood by himself and prayed: ‘God, I thank you that I am not like other people—robbers, evildoers, adulterers—or even like this tax collector. Two men gathered at the temple to pray. One opened his heart to God and exposed a need for more and the other, a Pharisee, opened his heart and exposed God to his greatness. While one, a tax collector, knew he needed to improve, the other knew, from his personal observations, that he was already great. The main difference between the Pharisee and the tax collector was pride. The Pharisee was filled with pride, and it directed his personal impression as well as his impression of others. While there is nothing wrong with being proud of ourselves or our accomplishments, there are numerous issues that arise when we are walking filled with pride. When we are prideful, we are not expressing the love of God, for we are filled with the love of self. When we are prideful, we are not showing people a life that is focused on Jesus. We are showing them an example that should not to be followed. We can bring forth more examples to expand the understanding of pride, or we can grasp what has already been stated and make a commitment to remove any ounce of it from our lives from this moment forward. What are you going to do? We all understand that Jesus had the authority to forgive sins while He was upon earth, but have we ever considered that we possess the same ability in a specific manner. We have the ability to forgive the sins of those who have brought negativity into our lives. We have the ability to release others from the heartache they are experiencing as it pertains situations we are involved in together. We do not have the ability to forgive all sins of all people, but we can choose to move forward in our faith and release those who have brought infractions into our relationships, so they might be placed on the road to recovery. Lord, help me become a forgiver, one who is willing to forgive and not retaliate. Some aspects of the Bible seem pretty harsh. It just seems unfair sometimes that a God who is considered to be loving, caring, compassionate, and merciful, would refuse to give us something we need and believe we deserve, forgiveness. While we might feel this, where we are considered, God is fair and just. The simplicity of it all is rather remarkable. God has chosen to allow us to receive forgiveness and mercy, as long as we are willing to extend the same to others. If we don’t want to be judged, then we shouldn’t judge others. If we don’t want to be condemned, then we should not condemn others. If we want to be forgiven, then we need to forgive others. Again, the simplicity is remarkable. As we bring into this world, we shall receive from Him who created this world. Lord, help me see the simplicity in forgiveness, mercy, and grace, and help me freely offer these to those who have brought hurt into my life, for they are truly deserving. Jesus had come into the home of Martha. Martha began to prepare a meal in honor of Jesus’ presence, while Mary sat at the feet of Jesus and hung on every word He brought forth into the room. Martha took her sister’s inaction as a negative response to a situation that needed dire attention. There she sat listening to Jesus, when she should have been assisting her sister in preparing the meal. Worry overtook Martha. She wanted to make a meal that was worthy of Jesus, but she seemed to be overwhelmed with the task. She went to Jesus in hopes He would encourage Mary to assist, but instead learned a lesson herself. Jesus understood Martha’s plight, but He wanted to make sure she understood that there were times when other things were more important. We worry so much about things that are out of our control, and this causes us to remain blind to some things that are important, things that can have an affect on our spiritual lives. Lord, help me understand what is truly important within my day, and help me refrain from worrying about those things that are not. Luke 12:25-26 Who of you by worrying can add a single hour to your life ? Since you cannot do this very little thing, why do you worry about the rest? How does the act of worrying enhance our lives? How does the act of worrying change anything within any situations? Worry can change our situations, but it is not usually for the better. Worry causes us to become cautious about advancing. Worry causes us to refrain from making decisions, and worry also has adverse effects on our health. When we worry, we cause a negative change within our blood pressure, which is the result of our the increase in our heart rate. If this persists, we can cause permanent damage. Knowing all that worry can do to us, why do we continue to allow it so much control of our lives? That, my friends, is a very good question. Let’s choose to begin to release our concerns into the presence of God and not allow them to negatively alter our lives. Lord, I desire to transfer to You all my worries and concerns, please help me make this come to pass.